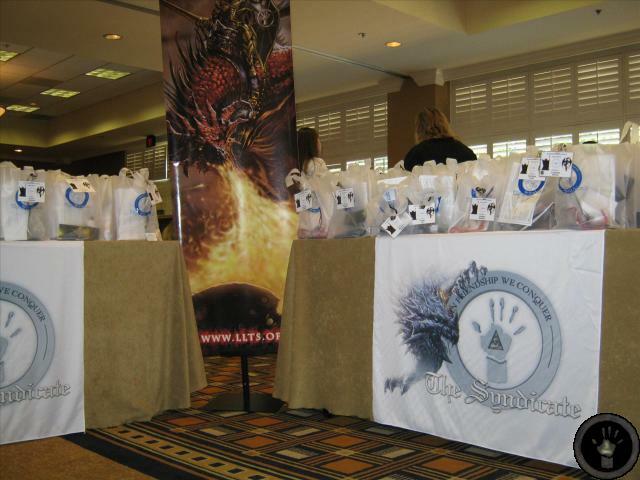 Since 2002, The Syndicate (www.LLTS.org) has been hosting an annual guild conference and charity event known as SyndCon. This year marked the 9th annual event which just concluded in San Diego. Thanks to generous corporate sponsorship, an all-star cast of software developers and hardware manufacturers and a first class series of tours, panels and events this year boasted more than 200 Syndicate members and invited guests. The capstone event takes place on the 3rd night of the conference and that is a large charity raffle. Items up for raffle are all donated by sponsors and they range from high end laptops, to signed artwork and other gaming memorabilia, to gaming consoles, to mountains of TShirts, games, posters and mousepads, to more one of a kind items such as a Lord of the Rings movie life sized replica shield. This year's event raised a good sum for our two chosen charities which are Youth Opportunity Unlimited (an organization that supports inner city youth with a variety of after-school programs) and the American Cancer Society (in honor of our members who lost their battle with Cancer and in support of those currently fighting the battle). Another feature of SyndCon is the Alienware LAN party. A number of networks Alienware M15x laptops formed the backbone of this year's event along with custom gaming mice, keyboards and headsets. That combination provided an exceptional gaming platform and many hours of tournament fun for conference attendees. In addition to those fun events, SyndCon featured tours of gaming studios, upcoming gaming demo sessions, closed door meetings about yet undisclosed titles, feedback and testing sessions on games and an annual meeting with a variety of industry legends as speakers. SyndCon reinforces the value of having a strong, unified online gaming community not only within the games we all enjoy and play but also to the development process. Planning for SyndCon 2011 is already underway and will mark the 10th annual conference and the celebration of the 15th anniversary of The Syndicate.